Jeff Gordon has been reporting and writing since 1977. His most recent work has appeared on websites such as eHow, GolfLink, Ask Men, Open Sports, Fox Sports and MSN. He has previously written for publications such as "The Sporting News" and "The Hockey News." He graduated from the University of Missouri-Columbia School of Journalism in 1979 with a bachelor's degree. NFL and NCAA football officials use the "10-second runoff rule" to punish teams for committing certain penalties that stop the clock in the final minute of either half -- or in the overtime period, in the case of NFL games. If the game clock has less than 10 seconds left when the referee orders the runoff, the half or game can end on this ruling. 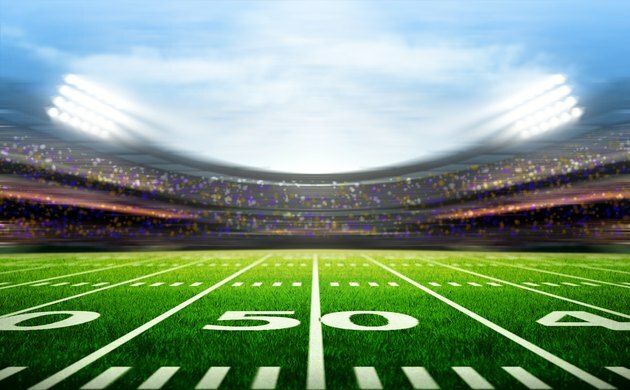 Before this rule was instituted, an offensive team with no remaining timeouts could deliberately commit a violation -- such as a false start, an illegal forward pass, a backward pass out of bounds or a ball spiked or thrown from the field of play after a play ended -- to stop the clock. The penalty resulted in lost yardage, but the clock stopped, and the punished team then ran a play. This tactic allowed teams to stop the clock in the final 10 seconds without using a timeout and then run one last play. Before rule changes, defensive teams with no remaining timeouts could deliberately commit an encroachment penalty to stop the clock. The punished team lost penalty yardage but got another opportunity to regain the ball. NFL rules do not call for a 10-second clock runoff in this scenario; rather, the play clock is reset to 40 seconds, and play may resume on the official's ready signal. The offense may allow the clock to run for 40 seconds without running another play, if it chooses. This effectively negates the game-stopping tactic. To prevent teams from faking injuries to stop the clock, the NFL opted to charge teams a timeout for injuries that halt play during the final two minutes of a half. If a team has used all of its timeouts, then a 10-second runoff occurs on the first injury. For each additional injury, a 10-second runoff and a 5-yard penalty are assessed. If a video replay review is ordered in the final minute of either half while the clock is running, the officials will order 10 seconds run off the clock. Either team can prevent the runoff by using a timeout. This rule prevents a team that is out of timeouts from gaining any benefit from a clock stoppage caused by replay review. The University of North Carolina rallied to beat the University of Tennessee, 30 to 27, in the 2010 Music City Bowl -- after spiking the ball to stop the clock, while still substituting players in and out of the game. The UNC Tar Heels were penalized, but they kicked a field goal to tie the game and then prevailed in overtime. As a result, the NCAA Rules Committee instituted a 10-second runoff rule that mimics the NFL rule. Had the Music City Bowl been played under the new rule, it would have ended with the clock runoff.